Brass Address Plaque with Two Large Brass or Aluminum Numbers - - personalized house number sign. Elegant, classic style is both tasteful and sophisticated. Two numeral brass address marker plaque is 10-5/8"W x 6"H and holds a two digit address number only, e.g., 43, 70, 15. Dimensional numbers are 3.75" high numbers (0.5" projection). 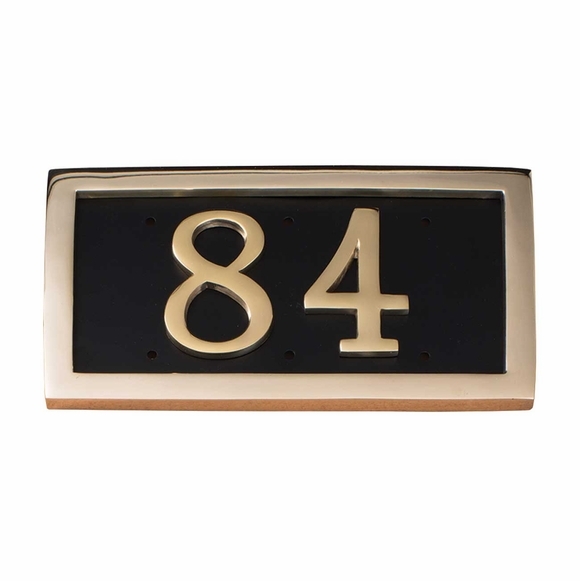 Brass back plate with polished brass numbers and border or aluminum numbers and border. Back plate is powder coated in black, red, or green. green background with aluminum numbers & border. Concealed mounting system has no exposed screws. Includes installation hardware and instructions. Clear coated with a 10-year finish warranty for enduring quality. Also available with three-, four-, or five-digits (see Related Products). If your house number consists of three, four, or five digits, please order the correct size sign as shown in the top three links in Related Products.